Photo Caption: In addition to turning into an outstanding poker player, Terrance Chan, from Vancouver, BC, is also pushing himself to the limit when it comes to athleticism. He began training and competing as a MMA fighter during the past year. On Tuesday night, Chan became the first player to hit four-cashes in 2012. He now has an opportunity to make a serious run for “Most Cashes in a Single Year” at the WSOP. To see more photos from the 2012 WSOP, please visit the official WSOP PHOTO BLOG. IS IT TOO EARLY TO TALK ABOUT BREAKING WSOP RECORDS? Terrance Chan, arguably the best Limit Hold’em player in the world never to win a gold bracelet, is on a current pace to break one of the Holy Grails of WSOP recordom – which is Nikolay Evdakov’s high mark for most cashes at a single series. The Russian, who sadly passed away earlier this year, cashed a whopping ten times at the 2008 WSOP. Chan, from Vancouver, BC (Canada), has entered four gold bracelet tournaments, to date. * He’s perfecto – going four for four. 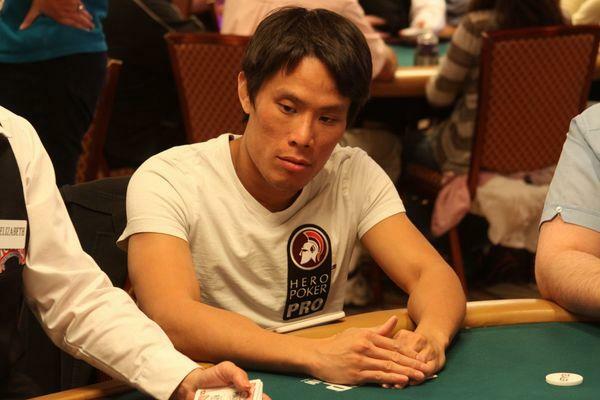 Chan’s chances of making a serious run at the record are strong, since his best poker games – particularly Limit Hold’em – are now approaching on the WSOP schedule. Chan needs six more cashes to tie Evdakov’s number, and based on 48 events remaining on the schedule, appears to be in the best position of anyone to eclipse the plateau. * Event #13 -- Limit Hold'em pending. The $10,000 buy-in Heads-Up No-Limit Hold’em World Championship began on Tuesday, with 152 players. At noon, players were randomly grouped into brackets. The odd-numbered field size meant that 104 players received a first round bye. So, only 24 first-round matches were played. Once there were 128 players, Round Two began and played to 64 survivors. Then, the day concluded with Round Three -- where 64 players played down to 32, which guaranteed an in-the-money finish. 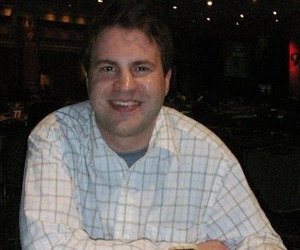 Highlights from the initial round were recent WSOP gold bracelet winner Andy Bloch’s early match against Swedish online poker marvel Viktor “Isildur1” Blom. Bloch proved to be no match for Blom, who was playing in his first WSOP tournament on U.S. soil (he played previously at WSOP Europe). However, Blom had a tougher go in the next round, losing to Tommy Chen. Brit Sam Trickett has been crushing the world’s biggest cash games the last few years. Good thing, because he’s off to a rough start at this year’s WSOP. Trickett was bounced out of the first round by Victor Ilyukhin of Russia. Second-round action began with a more-balanced field of 128 players. Notable happenings from the next series of matches included a few upsets -- including Russell Rosenblum defeating Vladimir Shchmelev as well as Cristiano Guerra cleaning out Shaun Deeb. Another notable match saw Jacob Godshall ax Jason Mercier. Battles of titans included Steve O’Dwyer besting Yevgeniy Timoshenko and Antonio “the Magician” Esfandiari making Isaac Haxton disappear. Leo Wolpert, who won this event in 2009, also made an unwanted walk to the exit door, as did 2010 winner Ayaz Mahmood. In the third round, the first player to reach the round of 32 – which meant a guaranteed in-the-money finish (worth $10,966) -- was Steven Landfish. Tommy Vedes, who is already enjoying a good WSOP, joined the money celebration soon thereafter. Less fortunate was Phil Ivey, who suffered a knockout blow on a bad beat, with Chae An throwing the final punch. 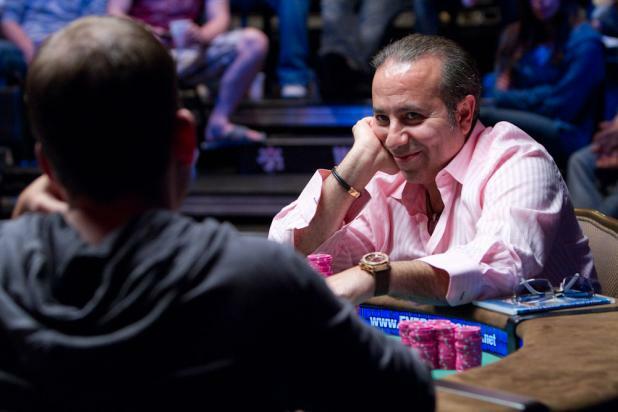 Michael “the Grinder” Mizrachi also hit the rail, kicked off to the side by bracelet holder Mark Radoja. This year, many eyes were on Jake Cody, the defending champion. He won the 2011 No-Limit Hold’em World Championship, defeating runner-up Yevgeniy Timoshenko in the final showdown. However, Cody failed to reach the money this time – exiting at the hands of Michael Drummond during the third round. With a new champion now guaranteed, the Heads-Up No-Limit Hold’em World Championship continues on Wednesday. Players hope to play at least three more matches -- with 32 reduced to 16, then 16 halved to 8, and finally 8 divided to 4. The final four survivors return on Thursday to play in the semi-finals, and ultimately for a WSOP gold bracelet. "Every &#%@*&$$! year I walk into the WSOP, it reminds me more and more of a giant airport. I mean, just look at this place. You need to find a TV monitor to see where to go to next. The way it’s going for me so far, it’s like I lost my plane ticket and they lost my luggage. They might as well have a proctologist doing the security." Today’s first tournament is a $75 buy-in TURBO MEGA-SATELLITE. EVENT #14, the $1,500 buy-in NO-LIMIT HOLD’EM SHOOTOUT tournament begins today with the first of three playing sessions. Late registration will be available for this event. However, due to the nature of the Shootout, the number of tables and seats will be cut off at some point, most likely about an hour into the event. * Action takes place inside Brasilia. The Pavilion White and Black sections will be used for overflow. This event will be capped at 2,000 players. EVENT #14 UPDATES can be followed at WSOP.com. Coverage includes almost-live chip counts as well as written updates supplied from the tournament floor by our friends at PokerNews.com. The official Structure Sheet for EVENT #14 can be viewed HERE. EVENT #9, the $1,500 buy-in NO-LIMIT HOLD’EM tournament continues with the play of Day Four – including the final table. There are 9 players remaining. Action will take place inside Amazon on the ESPN stage. Ryan Olisar leads the final table line-up, which also includes bracelet winners Brian Rast and Greg Mueller, and the fifth woman to make a final table this WSOP, Amanda Musumeci. Remaining players and chip counts can be viewed HERE. The winner will collect a whopping $781,398 -- plus a WSOP gold bracelet. EVENT #11 the $1,500 buy-in POT-LIMIT OMAHA tournament continues with the play of Day Three – including the final table. There are 9 players remaining. Action will take place inside Amazon. Charles Tonne is the big stack in that event. The final table also includes Alex Dozhenko, Calvin Anderson, and Tristan Wade, who will be going for his second gold bracelet. Remaining players and chip counts can be viewed HERE. The winner will collect $265,211 -- plus a WSOP gold bracelet. EVENT #12, the $10,000 buy-in Heads-Up No-Limit Hold’em tournament continues with the play of Day Two. There are 32 players remaining. Action will take place inside Amazon. EVENT #13, the $1,500 buy-in LIMIT HOLD’EM tournament continues with the play of Day Two. There are 222 survivors remaining. Play will take place inside Amazon. The first daily DEEP STACK NO-LIMIT HOLD’EM tournament begins. The entry fee is $235. Registration is open for four (30 minute) levels, plus one break – which means until about 4:20 pm. Today’s gold bracelet ceremony includes the winners of EVENT #6 (Aubin Cazals) and EVENT #10 (John Monnette). Two national anthems will be played – France and the United States. EVENT #15 is a $5,000 buy-in SEVEN-CARD STUD HIGH-LOW SPLIT tournament. Registration will be open for the first four levels of play (plus two 20-minute breaks). This means registration will close at approximately 9:40 pm. Action will take place inside Amazon. The Pavilion White and Black sections will be used for overflow. There will be a 60-minute dinner break. This is a three-day event. The second DEEP STACK NO-LIMIT HOLD’EM tournament begins. The entry fee is $185. Registration is open for four (30 minute) levels, plus one break – which means until about 8:20 pm. The second MEGA-SATELLITE of the day begins. The game is NO LIMIT HOLD'EM. The entry fee is $550. The third and final DEEP STACK NO-LIMIT HOLD’EM tournament begins at 10 pm. The entry fee is $135. Registration is open for four (30 minute) levels, plus one break – which means until about 12:20 am. All WSOP gold bracelet tournaments end for the night. The WSOP appears to be fusing into a nice comfort zone, as opening week jitters and questions have now passed. The so-called “meat” of the WSOP schedule is ahead, with nearly four full weeks of action – including just about every possible variety of poker game. A few notable stand-out events in the weeks ahead will be the $1,000 buy-in SENIORS WORLD CHAMPIONSHIP (EVENT #29) coming up one week from this Friday – June 15th. The $50,000 buy-in POKER PLAYERS CHAMPIONSHIP (EVENT #45) starts on June 24th. The $1,000 buy-in LADIES WORLD CHAMPIONSHIP (EVENT # 51) will be held beginning on June 29th. Cash game action continues to expand and is about as the same number of games as was spread last year. In coming weeks, as overall attendance increases getting closer to the Main Event Championship, the number of cash games is likely to surpass the busiest times at last year’s WSOP. There are 82 poker tables dedicated to cash games inside Pavilion, plus an additional 14 poker tables dedicated to cash games inside the Rio (Main Casino). Right now, the most popular game spread is $1-3 No-Limit Hold'em. However, games of virtually all limits are being spread – including a monster Pot-Limit Omaha game that is generating even bigger spectator crowds than some of the gold bracelet final tables. Single-table satellites are being held 24/7 inside the Pavilion. All satellite winners receive $500 buy-in tournament chips. John Monnette, a 30-year-old poker pro from Palmdale, CA won EVENT #10, the $5,000 buy-in SEVEN-CARD STUD WORLD CHAMPIONSHIP tournament. He collected his second gold bracelet. First place amounted to $190,826. The NEWS FLASH of John Monnette's impressive victory can be seen HERE. Also of note was Huu Vinh's second-place finish in EVENT #10. The deep run gave Vinh, from Huntington Beach, CA, his second final table appearance this year in a Seven-Card Stud event. Vinh took fifth place in EVENT #7. Eight former WSOP gold bracelet winners cashed in Event #10 – which was half of the number of players in-the-money. They were -- John Monnette, Perry Friedman, Jeffrey Lisandro, Eugene Katchalov, Cyndy Violette, Max Pescatori, Mike Sexton, and Nick Schulman. On Day Three, in EVENT #9, the $1,500 buy-in NO-LIMIT HOLD’EM (RE-ENTRY) tournament, played from 33 starters down to 9 survivors. 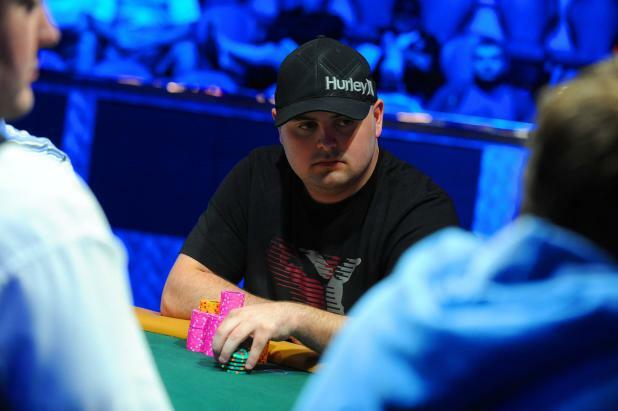 Ryan Olisar, from Naperville, IL currently leads the pack and will enter the final table as chip leader. On Day Two, in EVENT #11, the $1,500 buy-in POT-LIMIT OMAHA tournament, played from 117 starters down to 9 survivors. Charles Tonne, from China, MI currently leads the pack. On Day One, in EVENT #12, the $10,000 buy-in HEADS-UP NO-LIMIT HOLD’EM WORLD CHAMPIONSHIP tournament, played from 152 starters down to 32 survivors. Remaining players and bracket matchups can be viewed HERE. The winner will collect $371,498 -- plus a WSOP gold bracelet.